Have you ever come across the Native American Code of Ethics? These codes are not uncommon, many of us practice them every day. Just reading these repeatedly is zen. A reminder. I am intrigued most by the first in that list. The Great Spirit will listen if you only speak. On the 15th of January every year (+- 2 days), those of Indian origin too wake up early to pay tribute to the sun and its glorious harvest by celebrating the harvest festival. The harvest festival is a form of Thanksgiving celebration, and each state in India celebrates the occasion with its own name and unique rituals. Pongal roots date back 1000 years. According to Wikipedia, there is epigraphical evidence suggesting Pongal was celebrated as early as the Chola empire days. Today, it is celebrated widely by Tamils not only in India but also in Malaysia, Singapore, Sri Lanka, Mauritius, Kenya, South Africa, US, Canada and the UK. In Malaysia, Pongal is a 4-day festival to symbolise new beginnings. It is also an occasion to be thankful for the last harvest and to pray for the year ahead to be as prosperous. We celebrated this occasion just a few weeks ago. Bhogi marks the first day of the Pongal celebration. Traditionally on this day older items are discarded and replaced with newer ones. Spring cleaning is what I call it. For me, this is not a one-day event but rather an extended one (and therefore starts much earlier). It takes me more than a day to just get myself to look at the old things and then a few more to get my mind to figure out what I really need and many more days after that to convince myself to discard those things which I don't need. After all the hard work of shedding unused items and fighting the dust allergies, those empty spots get filled up again even faster. Cleaning done, shelves emptied. Next on the list is another exciting activity. Shopping! What, did I say that right? Yes, shopping. Told you those empty spots don't stay empty for too long. This time, it is vegetable shopping – to get various vegetables for the Kuttu Sambar. Yummy! Kuttu Sambar is a mixed vegetable gravy dish served with rice. Oh, yummy! 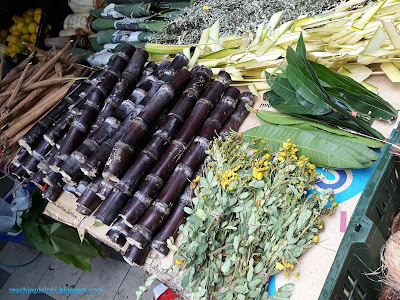 Another common sight during the Pongal festival is sugar cane. As I mentioned earlier, Pongal is a harvest festival. Sugar cane is one of the farm's harvest, and its abundance is a sign of prosperity, and its sweetness marks happiness. There are a couple more essentials for Pongal — fresh turmeric (with its bulbs and leaves), banana and mango leaves, Koorai Poo (these are the white flowers from the Aerva Lanata plant) and Avaram Poo (the yellow flowers below, Avaram Senna). Today, as people migrate between continents, they also bring along these unique traditions. And this is how Pongal has reached the many corners of the world. 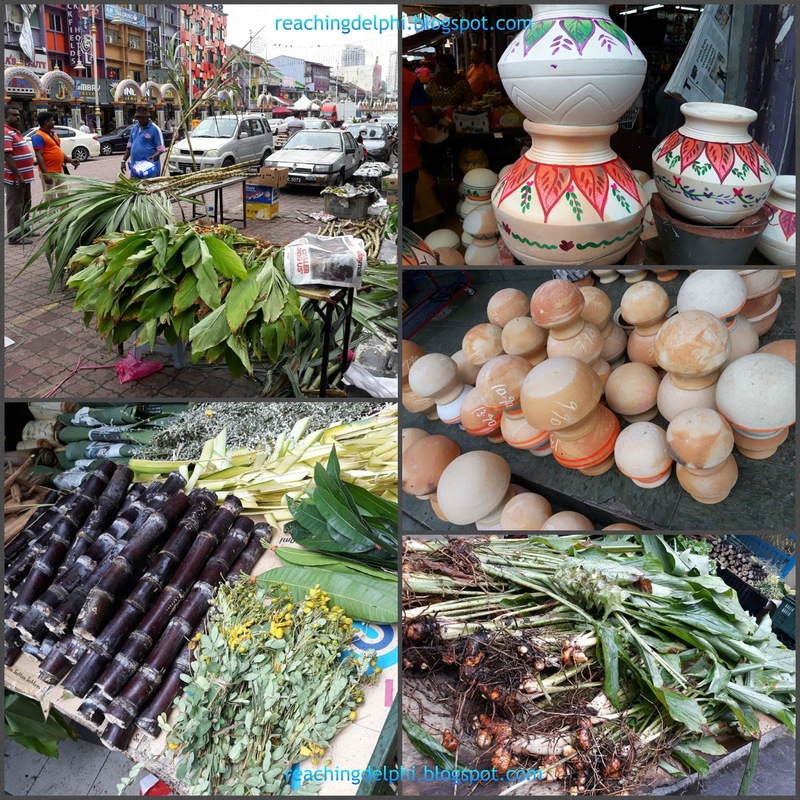 The images below show the familiar sights during Pongal in the suburb called Brickfields (little India) in Kuala Lumpur. Do you see the sugar canes and turmeric? Next is the main event — Thai Pongal. This is the day when we prepare the Pongal itself. 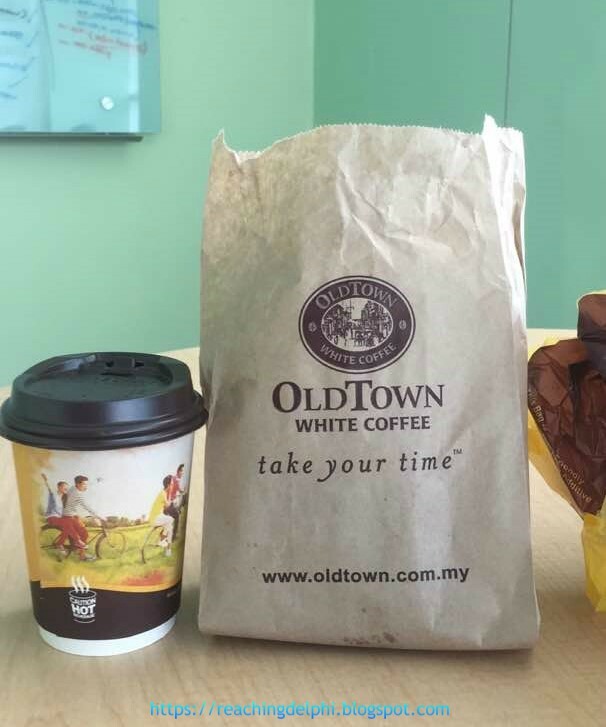 The must-prepare version is the sweet one. First, the milk is boiled in the selected vessel or pot. The vessel could be brass or new earthen pots decorated with kolam/rangoli. 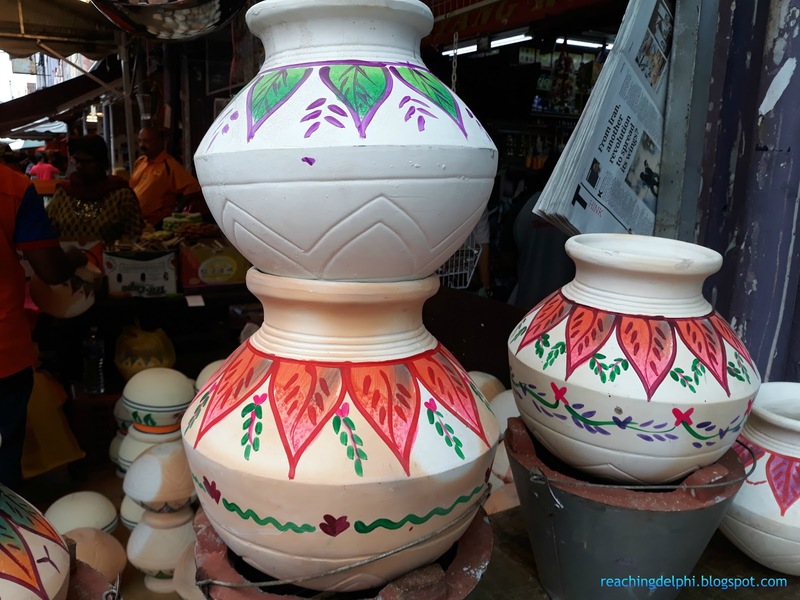 The mouth of the pot is tied with fresh turmeric leaves and turmeric bulbs. 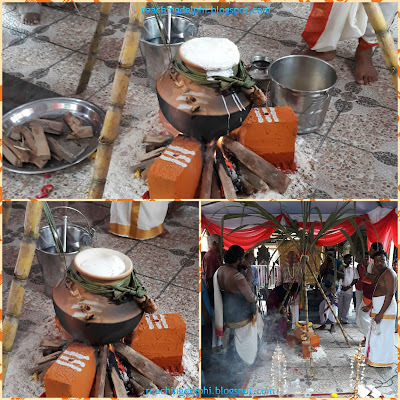 After a short prayer, the vessel is heated and milk is poured into it. Once the milk starts to boil and spills over, everyone is greeted with Pongal o Pongal. Then rice grains are added to the boiling milk. Brown jaggery (a form of sugar), along with sweet spices, nuts, scrapped coconut are added towards the end. Sometimes another version of pongal is also prepared. This version is without the jaggery and spices — a savoury one. 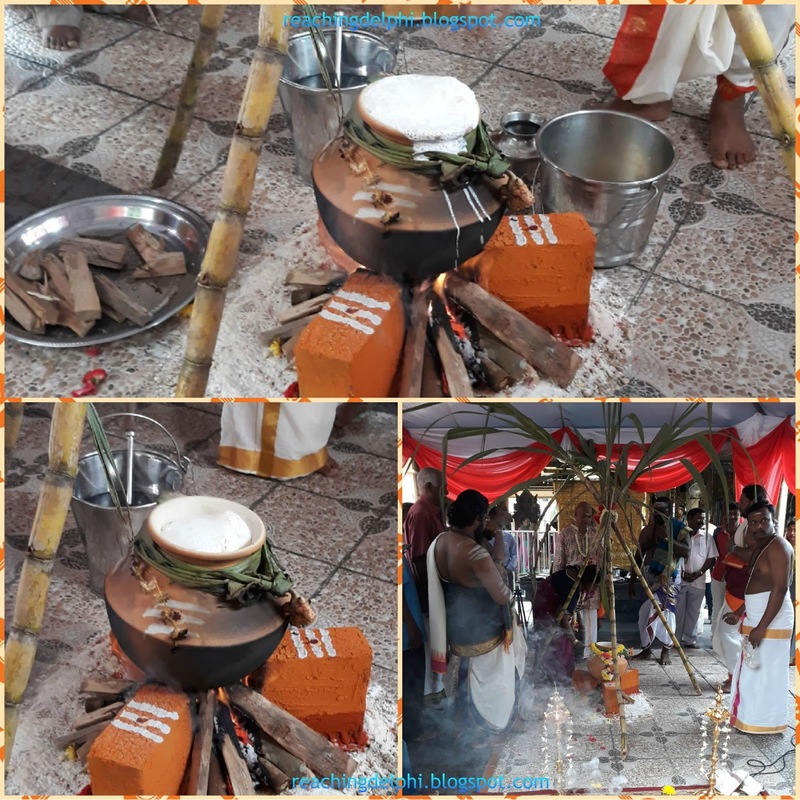 Below are pictures of the event at a nearby temple. 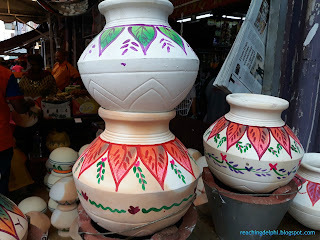 It is a custom also to prepare the pongal in our homes. The 3rd day is Mattu Pongal. This celebration is to honour the cattle. Families will decorate their cows with garlands and paint their horns with bright colours. The cow is a sacred animal and often considered part of the household. In Malaysia, we do not have cows at home, so we only make the pongal and remind ourselves to be thankful for the blessings we have. The next day is Kanni Pongal. It also marks the end of the harvest celebrations. On this day, young girls offer prayers in the hope of getting good husbands. Pongal is almost always in January. The celebrations begin on the first day of the 10th Tamil calendar month, Thai. Thai Masam, as we say it. The Native American Code of Ethics says the spirits will listen if you speak. 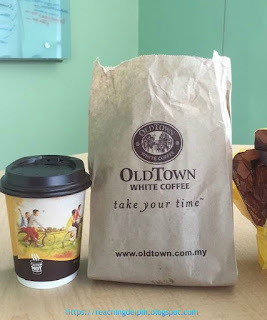 For me, these spirits speak back in different ways, perhaps it’s that butterfly that landed on your nose, a good harvest, passing an exam or even that coffee that you unexpectedly find waiting for you at your desk. Whichever it may be, I am thankful for the Sun, for our harvest, for our existence. Come out, I haven’t seen you in a while and I miss your shine. Pongal o pongal Uma. I enjoyed reading this post and seeing nice photos.